There’s No Will; What Can the Executor Do? Home / Blog / There’s No Will; What Can the Executor Do? The creation of a will is an important part of the estate planning process. This legal document protects not only you, but your spouse, your children, and other beneficiaries you name. A will makes it more difficult for outsiders to stake claim to your assets upon your death. It also helps ensure that your family will be taken care of once you’re gone. Have you been named the executor of an estate? If so, you have some serious responsibilities when the subject of the will passes away. But, what if there was no will or the will you have is invalid? Do you know what to do? Let’s explore this situation in today’s post so you know what to expect when such a situation arises. Who Takes Charge in Los Angeles, CA? 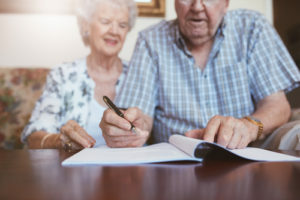 The first question you will ask centers around who takes charge of the estate when a will is invalid or when there is no will present after someone dies. There needs to be someone in charge of the estate after a person dies. The court could appoint someone during a probate hearing. This person would be known as the estate administrator. The first choice for this position is a surviving spouse or domestic partner. The court can then move to adult children and other family members, if necessary. If you need assistance requesting appointment as administrator, please contact my firm for assistance. If a probate hearing is not necessary in your individual circumstance because the size of the estate is too small, then there will not be an official administrator assigned by the court. Instead, the surviving spouse or an adult child will typically step in and handle the affairs of the estate. Our firm can help in these situations as well. The person who serves as the administrator or handles the affairs of the estate will be responsible for gathering and protecting the estate assets. From these assets, the representative will need to pay the debts and taxes of the deceased, and will need to distribute the remaining assets to those legally allowed to inherit it according to the state law. If there is a court proceeding, the distributions may only be made as the court orders. Who Can Inherit Assets in North Hills, CA? The next question that comes up often when there is no will present centers around who can inherit the assets of the deceased. Under most intestate succession laws, only a surviving spouse or blood relative is allowed to inherit assets of the deceased. Intestate succession laws only apply to assets that are not passed on through a living trust, a will, or any other legal mechanism. Charities, friends, and unmarried partners cannot inherit any asset when a will is not present. The surviving spouse will frequently receive the largest share of the assets. If there are no children, the surviving spouse will receive all of the assets. People who create a will typically name a guardian for their children in the will. When there is no will present and there are minor children and no surviving spouse, the court will need to appoint a guardian for the children. A will is important if you wish to identify your preference of the person to serve as guardian. In the absence of a will, the court may appoint an individual you would not necessarily have chosen to act as guardian.